Hey there readers of Geek Girl Blogger! 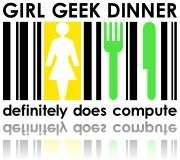 This Thursday night (28th August) Tim and myself will be attending a Geek Girl Dinner in Brisbane. We are looking forward to meeting a large new range of female bloggers. I personally am looking forward to seeing some bloggers in real life. Proof that they really do exist. All we know about them is what they write ... online ... what if they’re robots? What if they’re not actually girls? It could all just be a lie. So, to see them in real life and interact with them over a meal should be rather interesting. I will report back after this insane event. However if you never read another article by me again... assume the worst. It probably means it turned out they weren’t really what they seemed... aliens perhaps! I’m prepared for anything!